Topics: Brick It Now, & Website. The programming language environment is PHP/5.3.17-1~dotdeb.0. Online Marketing Group Pty Limited (, -) is the location of the nginx/1 server. 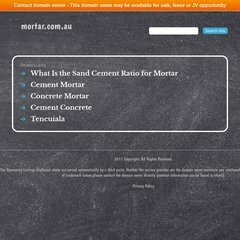 There are 6 DNS records, such as ns2.mortar.com.au, ns3.mortar.com.au, & ns4.mortar.com.au. PING www. (113.203.119.77) 56(84) bytes of data. A ping to the server is timed at 203 ms.